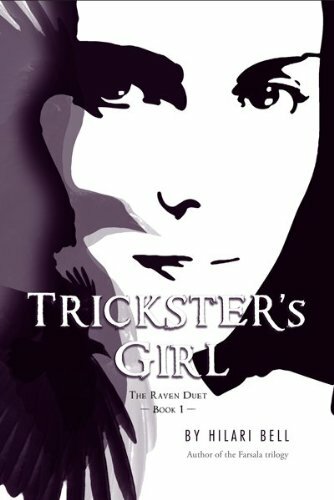 Trickster's Girl is an environmental dystopian sci fi/fantasy set around the year 2100. Kelsa is mourning the death of her father from cancer. She runs into a handsome, but very strange boy who convinces her that the leys, underground rivers of energy, have been damaged and that Kelsa is the person to fix them - by spreading magic dust at the nexus points. It sounds really weird, and I never did fully understand it, but basically, trees worldwide are being destroyed by humans. They have unknowingly messed with the energy that keeps nature going. Since humans broke it, only humans can fix it. Kelsa agrees to help fix the leys. Raven turns out to be an Indian shape-shifting spirit. A rather arrogant one at that. Kelsa and Raven set off on a journey that takes them from Provo to Montana, Idaho, Canada, and Alaska. Kelsa has to find the perfect nexus points to heal the damaged energy. Unfortunately, there are those who do not want the leys fixed. Kelsa not only has to save the world, so to speak, but make sure she doesn't get killed in the process. The plot is unusual, and as I said, I never totally "got it," but I was oddly drawn to this book. Kelsa and Raven slowly build a relationship. They start out as a reluctant partnership. Neither trusts the other, and they don't refrain from sniping at each other. But gradually, a friendship builds. It was interesting to see them work together. This book is not a romance. They form a friendship. I was expecting to see this turn into a romance and was a bit disappointed when it never did. The synopsis never indicates that it is a romance, but I just assumed. So don't expect one. A highlight of Trickster's Girl is the beautiful nature descriptions. In doing research for this book, Hilari Bell traveled from Utah from Alaska. Glaciers, forests, and lakes are all described in a way that I could see them vividly in my mind. I also liked the futuristic setting. The world was just different enough to be interesting (electronic ID cards that everyone carries, flying vehicles), but not so different as to be unrecognizable. I enjoyed Trickster's Girl. I would have liked it better if the plot had been more understandable and more relatable, but the story was still interesting. I never felt like I was forcing myself to read. The journey that Kelsa and Raven take, as well as their burgeoning friendship made the book a lot of fun, regardless of the plot. I'd recommend Trickster's Girl to anyone who is interested in the environment, futuristic settings, and the outdoors. Hi Alison! Thanks for following my blog (That's What Liz Read) I'm also following your blog now and I really love the layout! It's so cool that you're a manga lover. I've tried reading them, but I think I prefer anime =]. Anyways, do you have an email I could contact you at? I'm trying to design my own banner. I love yours and was wondering if you could give me a few tips? I also read this and although l didn't love the plot l was always drawn to the book too! Thanks for stopping by and recommending Jellico Road, Alison. I immediately reserved it at the library! Let's keep in touch: our tastes complement each other. I'm a huge Harry Potter fan too, though! I started this book and decided not to finish it. It wasn't that the book was bad, but the description I was given about the book didn't fit the actual plot. I was so disappointed about 60 pages in I just moved onto something I was dying to read. I'm glad you enjoyed the book.